Desire, Dylan's Bicentennial album, defied expectations for those expecting a sequel to Blood on the Tracks. On Desire Dylan inhabits other characters and even takes the third person perspective. The creative momentum of the Rolling Thunder Revue's autumn 1975 tour through New England, an insurgency against the stagnant rock scene of the mid-70s, carried itself into the studio. Everything about Desire feels quixotic, there's a desperation to pick up the pieces and to keep searching for answers no matter the cost. 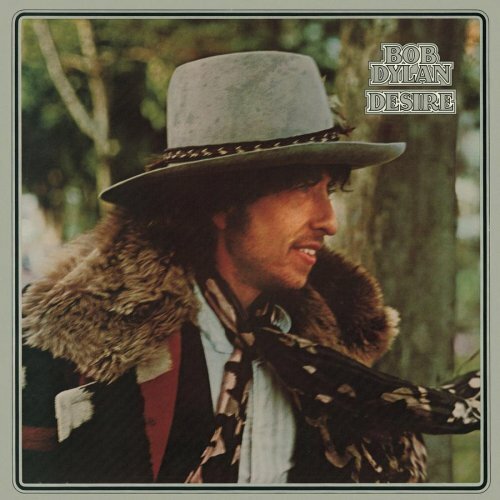 After years of dismissing protest music as pointless, Dylan opened Desire with "Hurricane", an angry statement on the ingrained racism of the justice system. The song, co-written with Jacques Levy (as were seven others on Desire), relates the story of middleweight boxer Ruben Carter's murder trial and subsequent conviction under suspect evidence. Some saw "Hurricane" as desperate cry for attention, Dylan's cynical attempt to remain relevant. But there's an energy to "Hurricane", not dated in any sense. "Joey" chronicles New York mobster "Crazy" Joe Gallo's rise and fall in the criminal underworld. Many took issue Dylan's mythologizing of a violent sociopath, notably rock critic Lester Bangs. But those objections now ring hollow, after all "Joey" plays like a precursor to Scorsese's wiseguy cinema. The background vocals of Emmylou Harris ratchet up the pathos. "Isis" marked a venture into speculative fiction. A reckless husband leaves his wife to go off in search of treasure into a land of "pyramids embedded in ice" and returns home with nothing left except the hope Isis will take him back. The travelogue songs are hit and miss. "Mozambique" imagines an idyllic locale full of beautiful strangers and romance. "Romance in Durango" and "Black Diamond Bay" are all about intrigue in exotic places, adding a lightness to the second side. "One More Cup of Coffee (Valley Below)" tells of a mystifying sojourn into a world free of modern trappings. "Oh Sister" and "Sara" are clearly related. "Oh Sister" is my favorite track, a mesmerizing recording with Dylan and Harris's twining voices set against Scarlett Rivera's weeping violin are unforgettable. "Sara" like "Hurricane" is so direct and personal, a bookend to "Sad Eyed Lady of the Lowlands." So Desire, for all its thrown together tequila fueled grasp at immortality may be just enough to get you through a dark night of the soul or inspire quiet contemplation on Saturday afternoon. All the rage against fate, happenstance, and circumstance suggest we can emerge from the other side, not unscathed, but still alive.